Francisca Ramirez, coordinator with the National Council in Defense of Our Lake, Land, and Sovereignty, takes a deep breath. “I was born in Fonseca. I live in Fonseca. I want to die in Fonseca.” If the canal partnership between Nicaraguan President Daniel Ortega and Chinese billionaire Wang Jing comes to fruition, her future home is uncertain. When I made my first trip to Nicaragua in 1987 with a Nicaragua Network coffee picking brigade, I learned a number of things. I learned that it was possible not just to oppose my country’s wars, but to support an alternative to war and capitalist exploitation. Exactly 100 years after its inauguration, the Panama Canal may soon become one of two waterways linking the Atlantic and Pacific oceans. 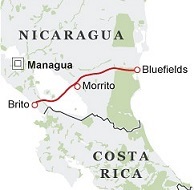 In a move that would alter world commerce, Nicaraguan President Daniel Ortega and Chinese telecoms billionaire Wang Jing have announced plans to start construction on a $40-billion canal across Nicaragua this December. An innovative development is currently taking place in Nicaragua. A number of co-operatives with Fair Trade contracts are including in the costs of production (for sesame oil and green coffee) a component for the unpaid work of women. They see this work as supporting production and creating stability – and, as such, deserving recognition and remuneration. 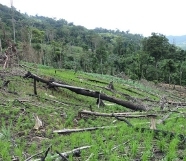 Mayangna indigenous communities in northern Nicaragua are caught up in a life-and-death battle to defend their ancestral territory in the Bosawas Biosphere Reserve from the destruction wrought by invading settlers and illegal logging. “They shoot everything, burn everything, poison the water in the rivers, and chop down the giant trees that have given us shade and protection for years, and then they continue their advance, and nothing stops them,” said Aricio Genaro, president of the Mayangna indigenous nation. La Isla is a small community located on the outskirts of Chichigalpa, Nicaragua in the Central America lowlands. Its sole economy is the sugar cane industry which relies on young men desperate to provide for their families ensuring an endless supply of labor. 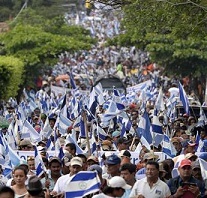 According to Nicaragua’s Supreme Electoral Council (CSE), between 78 and 80 percent of Nicaragua’s 3.3 million eligible voters participated in the November 6th election, re-electing Sandinista President Daniel Ortega with more than 62 percent of the vote and sending a Sandinista majority to the National Assembly. Since 1880, güirisería, or artisanal mining, has been the main economic activity in the municipalities that make up the so-called mining triangle in the North Atlantic Autonomous Region (RAAN) of Nicaragua. Artisanal gold extraction begins with the gathering of auriferous mineral from abandoned mines, external outcrop, or river sediments. This is done manually, sometimes with the aid of explosives.The current situation in the mining triangle, where industrial mining and güirisería coexist reinforces high poverty levels and the deterioration of human and environmental health. Daniel Alegría still thinks of himself as a Sandinista, “a Sandinista, no Orteguista.” He looks pretty much the same as he did when I first met him at Comedor Sara in January, 1984 where he spent his evenings drinking beer and talking politics with the internacionalistas who gathered there in the evenings.